The City of Ancona extends out like an amphitheatre on the promontory of Mount Conero, at 106 m above sea level, around a vast natural port: the edges of the promontory raise up the to the height of Mount Guasco on which the old part of the City extends and is dominated by the Roman Cathedral of San Ciriaco (of the 11th-13th Centuries), presenting Byzantine and Venetian influences. 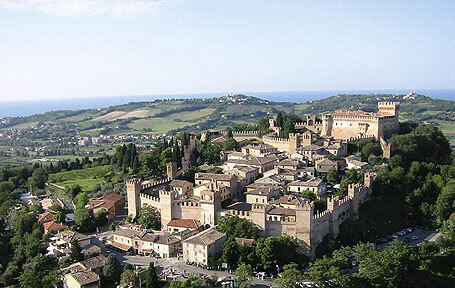 Pesaro, stretches out towards the sea, it extends between the hills of San Bartolo to the NorthWest and Ardizio to the SouthEast, including the old historic centre, protected from the East by the majestic Rocca Costanza and the modern City-Garden, aligned along the coast, with long tree-lined and rectilinear avenues. Urbino is historically famous for the Università Libera (Free University), founded in 1506. It is the seat of a renowned Academy of Beautiful Arts and an Institute for the Decoration and Illustration of Books. It is the native land of Raffaello Sanzio, Baroccio and Brandanti.